My third great-grandfather, William M. Sanford was a pioneer. He is the first ancestor that I have encountered that was identified as a pioneer in two different books relating the history of two very different places. He came with his father and brother from New York to near Saline, Washtenaw County, Michigan, in the 1830s to settle that area. Following his father’s model, he helped settle Wells County, North Dakota with two of his sons. Much like when his father settled Washtenaw County other family members also settled in North Dakota when he relocated there. He was a successful farmer in both locations and was known to have both cattle and sheep when he settled North Dakota. If you are descended from William M. Sanford or any of my other grandparents, please contact me. I’d love to how you fit into the family and I’d love to share notes, documents, photos, etc. Please use the contact form below. William M. Sanford was born on 30 March 1823 in Genesee County, New York, the second of nine children of Ezra and Almira (Chamberlin) Sanford. From all of these possible dates, none of them are compelling sources. Because the earliest record I have, the 1850 Census, suggests an 1823 birth year, I am going with that. That year is also confirmed by the History of Washtenaw County. 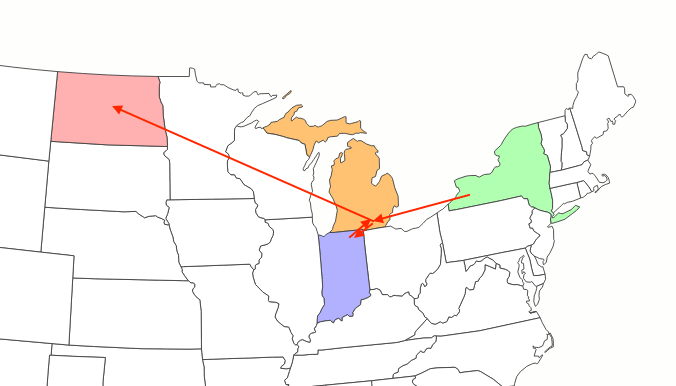 In 1836, when William was about 13 years old, William’s father, Ezra, his brother, Ezra, and he emigrated from and left his two New York to Michigan. They looked at several different counties, stopping in Calhoun County, but did not remain there long. They moved on to Noble County, Indiana, where Mr. Sanford bought lots near Rome City, Indiana (not to be confused with Rome, Indiana). The two boys (Ezra was about 19 old at the time) stayed in Indiana while Ezra senior returned to New York. The following spring, Ezra (senior) purchased 200 acres on Section 21 in Washtenaw County, Michigan. On 18 June 1844, William married Mary Electa Parsons in Benton, Washtenaw County, Michigan. William and Mary had seven children. Marion Sanford – born c. 1846. Marion married William Henry Brown about 1866; her death occurred sometime after 1885. Unknown Sanford – born April 1850 and died before 1860. Elva P Sanford – born c. 1852. She married William Wright on 27 April 1871; her death was sometime after 1929. Almon C. Sanford – born in October 1855; he died 3 April 1922. William A. Sanford – born c. 1858; his death was after 1880. George P. Sanford – born 7 October 1865; died 5 October 1932. Unknown Sanford – birth unknown; he or she died before 1881. The 1850 Census shows the young couple with two children, one unnamed infant. Living with them is J. W. Sanford, a 79-year-old farmer whose relationship is not known (by me). Also living with them is 11-year-old Charles Sanford. Again, I do not have a clear idea who these two individuals are. By 1863 the family had returned to Saline, Michigan, where William registered for the Civil War Draft. He was in “Class II,” which was everyone not in Class I. (Class I were those aged 20-35 and those 36-45 and unmarried.) William indicated he was 41 and married making him Class II. By 1870, Marion had married William Henry Brown and was out of the house leaving Elva, Alma (Almon), Willie (William) and George. Also living with William and Mary were four-day laborers. James Roach, George Coats, Gabriel Reeves, and Wilson Hoag. According to the 1880 Census, living with William and Mary in Saline, Michigan are three of their boys. Uhnond (Almon), William, and George. Also living with them are two “Servants,” Henry Morris and Joseph Evans. In 1883, the family relocated again and moved west. William Sanford with his sons A.C. (Almon C) and George located to Section 6, in northwestern Sykeston Township. We know that other of his family members located to North Dakota about that time, including his daughters, Marion and Eva and his brother, C. A. Sanford who was the donor of the Sanford Dormitory at Jamestown College. William had a successful farm, which included the first herd of cattle in the county, a thrashing machine, pedigreed stallions, and a large flock of sheep. Dakota Territory held a census in 1885. That census showed William and Mary living with their two sons, A.C. (Almon) and George. Also, living with them were two servants, George Huber and John Sager. It is interesting to note that William’s daughter, Elva, and her husband William Wright, show on the same Census page. In 1888, after 43 years of marriage, William’s wife, Mary, died. Five years later, in 1893, married Harriet Kent a 59-year-old widow. It appears that she died before 1900, because in the 1900 Census, the widower William is living with his son George (and George’s wife and son) in Township 146, Wells County, North Dakota. William married once again, on 26 February 1901, this time to Phila Geer Frisby. Sanford Marker – Photo by Cemetery Scavenger via Find a Grave; used by permission. William died on 5 June 1915 in Charlotte, Michigan, at the age of 92. His death was preceded by a fall where he broke his hip. He was then removed to Cathay, Wells County, North Dakota for burial. William was buried with his first wife, Mary Electa (Parsons) Sanford at Lake View Cemetery, in Cathay, ND. Follow-up on lives of all of William’s children. Once again, if you are descended from William M. Sanford please let me know how you are connected. I’d love to hear from you. Family Search; 1850 Census; (William Sanford) Michigan, Washtenaw, Saline, Sheet 737, Line 41 & following sheet. Google Books; History of Washtenaw County. Michigan: Together with Sketches of Its Cities, Villages, and Townships…. 1881. http://books.google.com/books?id=2z0XAQAAMAAJ. Google Books; History of Washtenaw County. Michigan: Together with Sketches of Its Cities, Villages, and Townships…. 1881. http://books.google.com/books?id=2z0XAQAAMAAJ. Page 1409. Family Search; 1850 Census; (William Sanford) Michigan, Washtenaw, Saline, Sheet 737, Line 41 and following sheet. 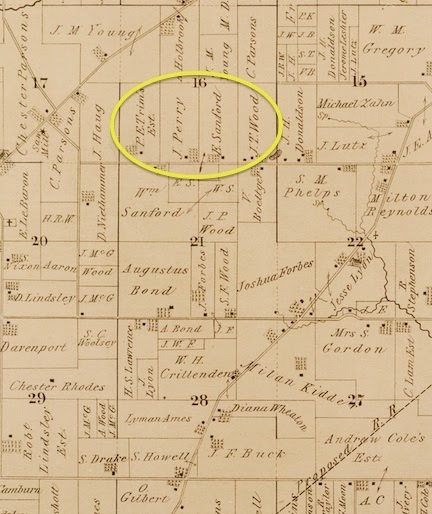 Family Search; 1860 Census; (William Sanford) Indiana, Dearborn, Aurora Center, Image 424. Ancestry.Com; U.S., Civil War Draft Registrations Records, 1863-1865; William Sanford. Family Search; 1870 Census; (William Sanford) Michigan, Washtenaw County, Saline, Page 17, Line 22. Spokesfield, Walter E.; The History of WELLS COUNTY NORTH DAKOTA AND ITS PIONEERS: With a Sketch of North Dakota History and the Origin [sic] of the place names. Valley City, N. D.: Publisher: Not Identified, Published in 1929. Find a Grave – Mary E Sanford – Memorial# 142980426. Family Search; Michigan Marriages, 1868-1925; William Sanford – Harriet Kent. Seeking Michigan; Michigan Death Certificate – William Sanford – Michigan, Eaton County, Charlotte.